Lack of updates, sorry guys. Have been busy with finishing up at work and other commitments! Weight Gain: Total of around 8kg, after initial loss of 7kg. Maternity Clothes: Pants yes, tops not really - I still fit into most of my old tops (but most of them are bigger and baggy anyway. Sleep: Terrible night's sleep last night but generally pretty good. My usual pattern is two "bad" nights (ie waking up more than twice) followed by one good night. Embarrassing Pregnant Moment: None that I can think of! Best Moment this week: No real "best" moments - just knowing it's not long till we get to meet you. Movement: Gives me a few good bashes every now and then but has definitely settled down into a pattern (although I'm still working out what that pattern is). How’s Mummy? Getting a little over being pregnant and just want to meet our little girl already - hoping you'll show up before your due date but who knows - just want it to be done! What I am looking forward to: ARRIVAL DAY! 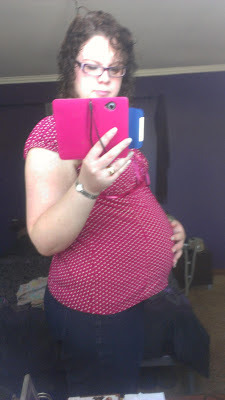 Our Baby in Veggie/Fruit Terms: Baby is now the size of a watermelon, approximately 3.5 - 4kg and 50cm in length. What Baby Peanut is up to: The last bits of vernix caseosa (the white goo keeping baby's skin moist) and lanugo (downy hair) are slowly shedding into your amniotic fluid. Baby's head is about the same circumference as her abdomen, and her head could be covered in an inch or so of hair.